Here's a rare and mysterious Vega for you...rare because it never was built, and also rare because I've never seen this drawing anywhere else--not even in authoritative Lockheed histories. 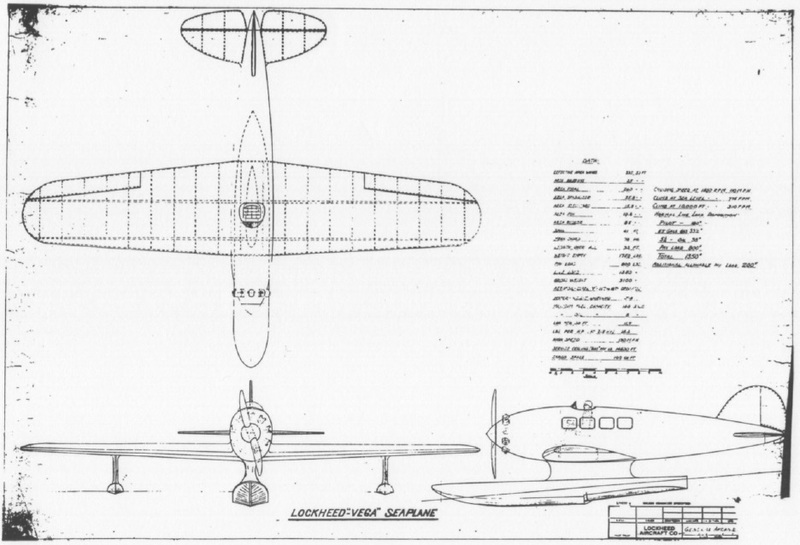 This concept drawing was among some other Lockheed materials dated 1927 which I just found. This drawing has no date, but it's really fun to look at a document with initials "G. V" on it that was created just 3 weeks after the first Vega flew and then realize that was-soon-to-be-famous Gerry Vultee. As I understand it, the second Vega built was supposed to turn out like this. But after Arctic adventurer Wilkinson bought it they determined it wouldn't do the job and he used a Vega. Later, they built him a Model 4 Explorer landplane with a larger wing and greater fuel capacity. For those not familiar, the Lockheed family included the Model 1 Vega, Model 2 and 2A Vega, Model 3 Air Express, Model 4 Explorer, Model 5 Vega, Model 6 perhaps this?, and the Model 7 Explorer. But they were not constructed in that order, just to confuse the issue. The Model 8 Sirius, Model 8D Altair, and Model 9 Orion completed the wooden Lockheed line before the introduction of the Detroit-Lockheed DL-1 Vega with a metal fuselage and the all-metal, twin-engine Model 10 Electra.